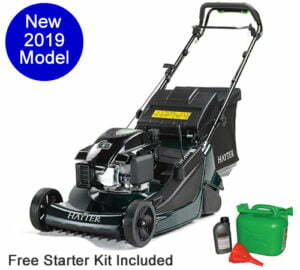 It’s springtime and the grass is growing, in this blog post, I will bring you a selection of our various lawnmowers for 2019 from budget machines to top of the range lawnmowers. I always say to people, buy the best machine that you can afford, most of us have to set a budget when we are buying a product, so we need to be careful. I can give you an example of the difference between buying a cheap product and a more expensive product. My late father purchased a Ransomes Ajax 12 inch push mower around 60 years ago, he treated this mower with great respect, cleaning and oiling it after every use! This mower is still working today! I have no idea how much he paid for this machine, but he certainly got his money’s worth! This particular machine was a very well engineered product and I know we cannot always afford to buy the best, however, there are many quality machines out there that will last you many years if you look after them. Our cheapest lawnmower, The Webb H12R Hand Push Cylinder Lawnmower costs just £79.99, it’s a basic push lawnmower, but sometimes basic is good! No engine to go wrong, no fuel to buy, no batteries to buy and no cable to annoy you, just a bit of human energy required! 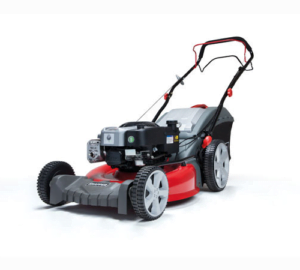 This lawnmower is what we would describe as a traditional lawnmower, it comes with a 12 inch (30 cm) five-bladed cylinder which can give your lawn a great finish, just remember that you need to cut your lawn regularly with a cylinder Lawnmower. In case you don’t understand what a five-bladed cylinder is, the more blades the finer the cut, so for example on a bowling green you may use a 10 bladed cylinder as you are just cutting a fraction of grass off at a time. One thing you need to remember with a cylinder mower is that it is a very precision cutting action and you need to take utmost care to keep your lawn free of any debris like stones and twigs, failure to do this can bring your cylinder out of line and make the cutting efficiency inefficient. The web cylinder mower has a rear roller and gives a nice striped finish and comes complete with an 18 L grass collection box. This is a simple traditional lawnmower at a great price and is definitely worth thinking about if you have a small lawn. You can find out more about the Webb H12R Hand Push Cylinder Lawnmower here. Another machine worth looking at is The Mountfield HP414 Push Petrol 4 Wheel Lawn mower, this petrol lawnmower costs only £149! To be fair, I don’t know how they can make this machine so cheaply, especially a petrol lawnmower! Having said this, I have used one of these machines and although it’s not a luxury mower, it does actually cut the grass and collect at the same time in a reasonable way. The Mountfield HP414 Push Petrol 4 Wheel Lawn mower is a 15 inch (39 cm) with a 100 cc petrol engine, complete with a 40 L collecting box. 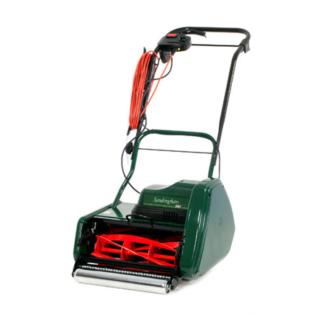 The machine can be used with or without the box, for example, in hot weather sometimes it’s good to leave the grass on the lawn as it almost acts as a fertiliser, or see if the grass is too long you do not want to do this. To be fair this is a budget petrol mower at a fantastic price and it does the job, it’s not the Rolls-Royce of mowers, but if you want a cheap budget mower, this could be the one for you. You can find out more about The Mountfield HP414 Push Petrol 4 Wheel Lawnmower here. Another budget mower is the Flymo HoverVac 280 Electric Hover Mower, this electric hover mower sells at £79.99 which again is a great price for a budget lawnmower. I have to say that I’m not keen on electric mowers, the biggest things for me is having that electric cable continually being in the way, I much prefer to have something with a proper engine on! 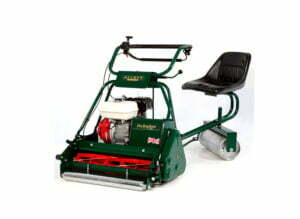 However, if you’re looking for a budget mower and like the idea of an electric lawnmower, this could be your answer! Of course, the great thing is with an electric mower, there is no engine to start, no oil to change and no fuel to add, simply plug in and go! The Flymo HoverVac 280 Electric Hover Mower floats on a cushion of air making it very easy to push. It comes with an 11 inch (28 cm) cut and is designed for a small garden. 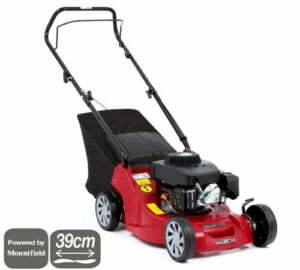 The mower comes complete with a 20 litre integral box and has four different cutting heights. For more details on the Flymo HoverVac 280 Electric Hover Mower, please go here. If you don’t want to spend too much money on your lawnmower but at the same time want a semi decent lawnmower, here are a few examples to help you choose. The Hayter Spirit 41 Push Petrol Rear Roller Lawn mower is a small push roller rotary lawnmower that will give your lawn that’s very British striped finish! Hayter have been making lawnmowers for many years so by purchasing a Hayter you have a great spare parts network. 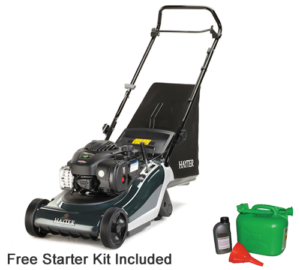 To find out more about The Hayter Spirit 41 Push Petrol Rear Roller Lawnmower, take a look here. Here is another midrange lawnmower, the Snapper NX-40 16 inch Self Propelled Petrol Lawn mower costs £349 and is a self-propelled machine, so minimal effort is required to cut your lawn! 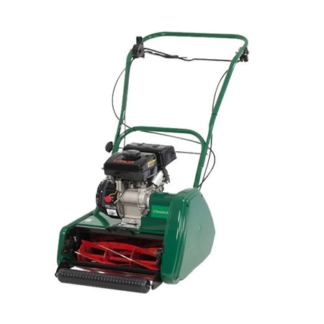 This is a 16 inch (42 cm) for wheeled lawnmower which will cut your grass with ease, it’s small enough to move around obstacles, but at the same time can cover your lawn fairly quickly. The good thing is with four-wheeled rotary mowers is that they normally have a reasonably efficient grass collection system as the grass is blowing directly into the collection box at the rear of the lawnmower, these type of machines are great for cutting small paddocks around buildings. 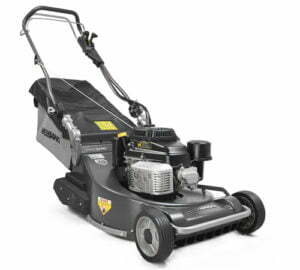 You can find out more about the Snapper NX-40 16 inch Self Propelled Petrol Lawnmower here. 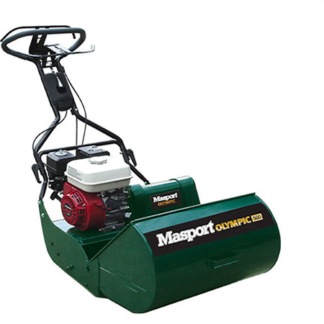 Now the sort of machines that I will discuss here are quality lawnmowers that are suitable for the keen gardener and contractors, they will give you many years of service providing that you take care of them. The Weibang Legacy 56 Pro 3 speed Self-Propelled Rear Roller Lawn mower is a great roller rotary lawnmower that sells at £1349. This is a great machine that I have personally used many times, it comes with a five year domestic warranty and three-year commercial warranty. The only catch is that you have to have this machine dealer serviced to keep the warranty valid, but in my mind, this is well worth it. The Weibang Legacy 56 Pro 3 speed Self-Propelled Rear Roller Lawn mower has a 22 inch (56 cm) cut and is powered by a Kawasaki engine. The mower drives itself through the rear roller and has a three speed solid gearbox. This is a machine that I really do recommend, it leaves a great striped finish and is a very solid lawnmower, the fact that this lawnmower has five years warranty suggests something to me. You can find out more about the Weibang Legacy 56 Pro 3 speed Self-Propelled Rear Roller Lawnmower here. If you are looking for a quality machine and for that perfect bowling green look then The Allett Buckingham 30H s/p 76cm Cylinder Mower Honda 6.5hp GX200 Engine may be an option for you. 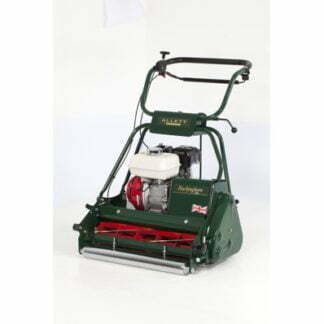 This is the most expensive cylinder lawnmower in our range, it sells for £4359, however, this is a professional machine and if it is looked after properly it could literally last you a lifetime. As I always say, it’s cheaper in the long run to buy a quality product! 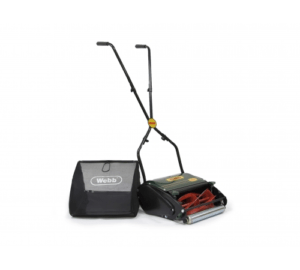 The Allett Buckingham 30H s/p 76cm Cylinder Mower Honda 6.5hp GX200 Engine comes with a six-bladed cylinder for that perfect fine finish. It is powered by a Honda 6.5 hp petrol engine and has the option to have a roller seat attachment, so no walking! 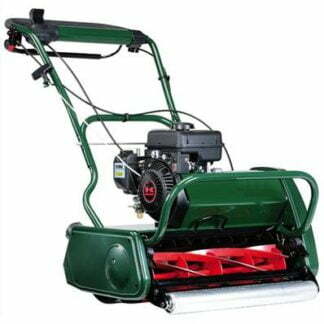 To find out more about the Allett Buckingham 30H s/p 76cm Cylinder Mower Honda 6.5hp GX200 Engine, please click here. 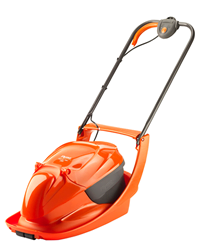 We have many more lawnmowers on our website, but here are a few to look at for starters. Previous post: Can a Tiller, Cultivator Or Rotavator Help You In Your Garden?